This is the eighth in a series of articles that address how muscles work synergistically to create efficient movement at each joint. The previous article examined the muscles that support the thoracic spine; this discussion covers the posterior muscles of the cervical spine. The cervical spine’s muscle functions are more intricate and delicate than those of other spinal muscles. To decrease the potential for injury, be extremely conservative when using the joint range of motion (ROM) exam and suggested exercises. Under no circumstances should the movements or exercises be applied to any client with current injury or pain. To understand the function of the muscles that stabilize the cervical spine and occiput, we must first look at the muscles’ anatomy and study their function in cervical and capital motion. As with the muscles that extend the lumbar and thoracic spine, there is significant overlay between the muscles that extend the cervical spine and occiput. Such overlay makes it important to recognize the functional similarities between these muscles when you evaluate ROM or recommend exercises. Although integrated, the associated muscles have different functions relative to their insertions on the cervical spine or occiput. In general, the cervicis muscles regulate cervical extension; the capitis muscles regulate occipital extension. This muscle runs superficially to the semispinalis capitis. With the splenius cervicis, it has an excellent lever arm for both cervical and capital extension. In addition, the splenius capitis both rotates and laterally bends the head to the same side when working unilaterally. This muscle runs superficially to the semispinalis cervicis. With the splenius capitis, it has an excellent lever arm for cervical spinal extension. The splenius cervicis also rotates and laterally bends the cervical spine to the same side when working unilaterally. 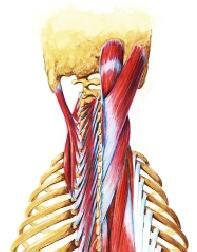 This large muscle runs up the cervical spine and deep to the splenius capitis. With the semispinalis cervicis, it has a major role in extending the cervical spine and maintaining cervical lordosis. Working bilaterally and with the cervical spine stabilized, it has a great mechanical advantage for capital extension: The muscle’s attachments are placed well behind the axis, creating a long lever arm for extension. Working unilaterally, the semispinalis capitis rotates the head to the opposite side while laterally bending to the same side. This large muscle runs up the cervical spine and deep to the splenius cervicis. With the semispinalis capitis, it also helps extend the cervical spine and maintain cervical lordosis. Through its attachment on the axis, the semispinalis cervicis stabilizes the axis, which provides an anchoring mechanism so the suboccipitals can function properly. The positioning of the attachments places the muscle well behind the axis and creates a long lever arm for extension. Working unilaterally, the semispinalis cervicis creates rotation of the cervical spine to the opposite side while laterally bending to the same side. This muscle runs deep to the splenius capitis and laterally to the semispinalis capitis and functions in extension of the cervical spine and occiput. It has a greater lever arm when functioning unilaterally to bend laterally and rotate the head to the same side. This muscle runs deep to the splenius cervicis and laterally to the semispinalis cervicis and functions in extension of the cervical spine. Like the longissimus capitis, it has a greater lever arm when functioning unilaterally to bend laterally and rotate the cervical spine to the same side. These deep muscles of the erector spinae run obliquely from the upper thoracic and lower cervical transverse processes and two to four levels up the spinous processes to C2. The multifidus cervicis stabilizes the cervical spine and regulates the anterior shear of each segment. These deep muscles run laterally, originating from ribs 3 through 6 and running up and into the transverse processes of C4 through C6. Lateral to medial fiber alignment positions the iliocostalis cervicis to assist in cervical rotation to the same side. These deep muscles of the erector spinae run vertically up the spinous processes from the upper thoracic vertebrae to C2. This muscle group has a poor mechanical position for movement and is noted more for segmental stability and proprioceptive feedback. The following tests identify muscle weaknesses in the cervical and capital extensor muscles. For each test, instruct the client to perform the required movement while you check for asymmetrical motion. Isolating weak muscles in the cervical spine and occiput during the ROM exam can be complicated. Because the neck muscles intertwine, subtle changes in position can affect the muscles being emphasized. As with previous ROM exams that covered the spinal extensors, you will attempt to isolate groups of weak muscles rather than use a specific ROM test for each extensor muscle. The muscles are listed in order of emphasis with respect to the particular movement. 1. Prone, Extension of Cervical Spine, Maintaining Neutral Position of Occiput (No Capital Extension): Lying prone with head off the end of a bench, client actively extends cervical spine while keeping chin neutral (no capital extension). Shoulders must remain flat, and motion must be achieved only through cervical spine. Limited motion represents weakness of splenius cervicis, splenius capitis, semispinalis cervicis, semispinalis capitis and longissimus cervicis. 2. Prone, Extension and Rotation of Cervical Spine, Maintaining Neutral Position of Occiput (No Capital Extension): Lying prone with head off end of bench, client actively extends and rotates cervical spine while keeping chin neutral (no capital extension). Limited motion represents weakness of splenius cervicis, splenius capitis, semispinalis cervicis, semispinalis capitis, longissimus cervicis and iliocostalis cervicis. 3. Prone, Extension of Cervical Spine With Capital Extension: Lying prone with head off end of bench, client actively extends neck and head. Shoulders must remain flat, and motion must be achieved only through cervical spine and occiput. Limited motion represents weakness of splenius capitis, semispinalis capitis and longissimus capitis. 4. Prone, Extension and Rotation of Cervical Spine With Capital Extension: Lying prone with head off end of bench, client actively extends and rotates head. Limited motion represents weakness of opposite-side semispinalis capitis and same-side semispinalis capitis and longissimus capitis. CAUTION! If the client expresses apprehension or experiences pain in any position, do not perform the ROM test. Consider the associated muscles weak. When recommending strengthening exercises for the extensor muscles of the cervical spine and occiput, consider each muscle’s role in head and neck motion. Because the extensor muscles work together to create stability through the cervical spine and occiput, these spinal extensor exercises focus on motion as opposed to the isolated strengthening of each muscle. Be extremely cautious when working with muscles that support the cervical spine and occiput. To ensure a conservative approach, have the client perform each isometric exercise with 15 degrees less than extreme ROM to reduce the risk of cervical spine instability. Performing isometrics at 15 degrees less than total ROM also provides a 15-degree carryover in isometric strength, which helps stabilize the cervical spine as the client moves into extreme ROM for extension and rotation. Because extreme caution is required when you work the cervical spine and because the application of resistance is difficult (considering the motions involved), no weight-loaded exercises are described. Manual resistance applied by the trainer is most effective to strengthen the neck muscles through their ROM and will be described in both the concentric and the eccentric phases of the involved motion. Apply only light resistance and allow the client to move smoothly through ROM. You may modify the pressure, according to the client’s effort. Caution! If the client expresses apprehension or experiences pain when performing any of these exercised, stop immediately. 1. Cervical Extension Isometrics: Emphasizes splenius cervicis, splenius capitis, semispinalis cervicis, semispinalis capitis and longissimus cervicis. CAUTION! If client expresses apprehension or experiences pain when performing this exercise, stop immediately. Lying prone with head off the end of a bench, actively extend cervical spine, keeping chin neutral (no capital extension) as trainer applies isometric resistance. Place action hand on client's posterior skull. Client performs 6 repetitions, holding each for 6 seconds. 2. Cervical Extension Isometrics With Rotation: Emphasizes splenius cervicis, splenius capitis, semispinalis cervicis, semispinalis capitis, longissimus cervicis and iliocostalis cervicis. Lying prone with head off the end of a bench, actively extend and rotate cervical spine, keeping chin neutral (no capital extension) as trainer applies isometric resistance. 3. Capital Extension Isometrics: Emphasizes semispinalis capitis, splenius capitis and longissimus capitis. Lying prone with head off the end of a bench, actively extend cervical spine and occiput, as trainer applies isometric resistance. 4. Capital Extension Isometrics With Rotation: Emphasizes opposite-side semispinalis capitis and same-side splenius capitis and longissimus capitis. Lying prone with head off end of bench, actively extend and rotate cervical spine and occiput as trainer applies isometric resistance. 5. Cervical Extension—Manual Resistance: Emphasizes splenius cervicis, splenius capitis, semispinalis cervicis, semispinalis capitis and all cervical extensors. Lie prone with head off end of bench, cervical spine flexed and chin neutral. Client actively extends cervical spine against trainer's resistance, keeping occiput neutral. Do not allow capital motion; keep emphasis on extension of cervical spine. Client returns cervical spine to flexed position, eccentrically resisting flexion applied by trainer. Client performs 2 sets of 12 repetitions. 6. Cervical Extension With Rotation—Manual Resistance: Emphasizes opposite-side semispinalis cervicis and semispinalis capitis and same-side splenius cervicis, splenius capitis and longissimus cervicis. Client actively extends and rotates cervical spine aainst trainer's resistance, keeping occiput neutral. Client returns cervical spine to flexed position, eccentrically resisting flexion and counter rotation applied by trainer. Client performers 2 sets of 12 repetitions. 7. Capitial Extension—Manual Resistance: Emphasizes semispinalis capitis, splenius capitis and longissimus capitis. Lie prone with head off end of bench and cervical spine and occiput flexed. Client actively extends cervical spine and occiput against trainer's resistance, keeping occiput neutral. 8. Capital Extension With Rotation—Manual Resistance: Emphasizes opposite-side semispinalis capitis and same-side splenius capitis and longissimus capitis. Lie prone with head off end of bench, cervical spine flexed and chin tucked. Client actively extends and rotates cervical spine and occiput against trainer's resistance. Client returns cervical spine to flexed position, eccentrically resisting flexion and counterrotation applied by trainer. 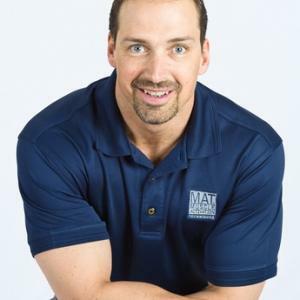 Greg Roskopf, MA, is the owner and developer of Muscle Activation Techniques (MAT) in Denver, Colorado. He is a biomechanics specialist focusing on identifying and addressing muscular imbalances. He works with elite and professional athletes while serving as a consultant to various professional teams, including the Denver Broncos. In addition, Greg specializes in working with clients suffering from physical disabilities and various disease states. ... read more.